Pluto just got another sibling. 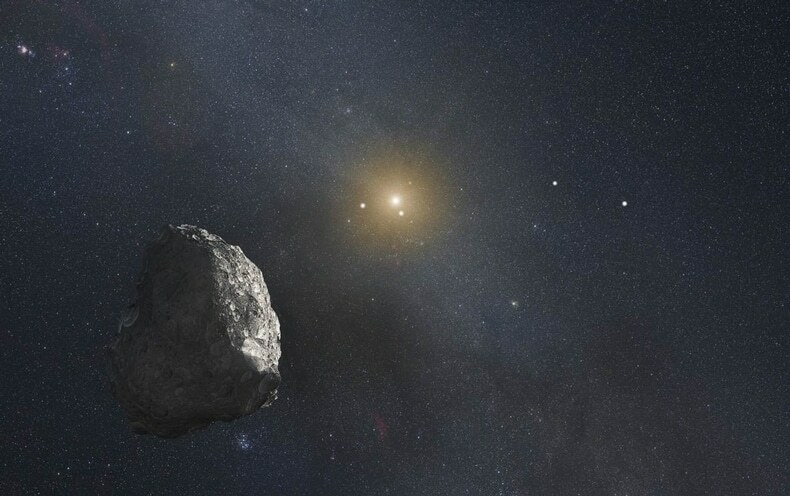 In the time since the definition of a planet changed and Pluto was downgraded, we have discovered a whole bunch of dwarf planets lurking within our solar system, and scientists have uncovered yet another: 2014 UZ224. Located about 13.7 billion km (8.5 billion miles) from the Sun, 2014 UZ224 measures about 530 km (330 miles) in diameter and takes around 1,100 Earth years to complete its orbit. While its status as a dwarf planet is still awaiting confirmation by the International Astronomical Union (IAU), the organization has already included it in its Minor Planet Center’s list, joining the brotherhood and sisterhood of dwarf planets, which includes Eris, Haumea, Makemake, Ceres, and Pluto. 2014 UZ224 was discovered using a rather sinister-sounding instrument called the Dark Energy Camera (DECam), which was built to observe galaxies and supernovas as they move away from Earth (as “dark energy” is what powers the universe’s continuing expansion). Using images from the DECam, a project called the Dark Energy Survey (DES) is creating a map of the universe to help study dark energy. It was through these DES maps that students of University of Michigan astronomy professor David Gardes discovered 2014 UZ224 about two years ago. A lot remains to be seen when it comes to our solar system. Gardes believes that their DES maps, plus the software his students developed to analyze data from them, may help reveal the elusive Planet Nine — a potential planet the size of Neptune. “I’m excited about our chances of finding it,” Gardes told NPR. As we improve our ability to view our surroundings in space, it’s no surprise that we continue to discover more of these previously hidden celestial objects lurking in the galaxy. Space telescopes are getting better and better, and they will only continue to do so with the James Webb Space Telescope (JWST) scheduled to launch in 2018 and the Advanced Technology Large-Aperture Space Telescope (ATLAST) some time between 2025 to 2035. If Planet Nine is out there, it won’t be able to remain hidden for long.